Ohakune has its giant carrot. Taihape has a gumboot and Gore a leaping trout. 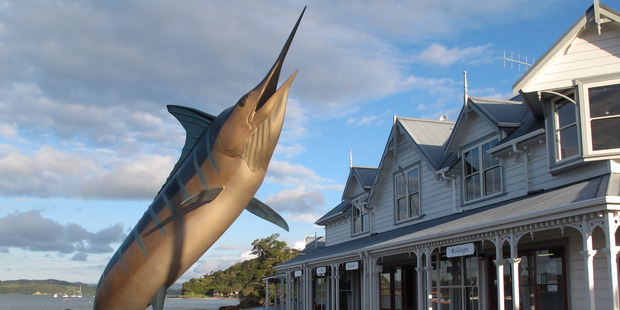 Now Paihia has joined the ranks of Kiwi towns with big icons thanks to the Fuller family, who have donated a life-size leaping marlin to the Bay of Islands town. The 4m-tall marlin was unveiled last Saturday by donors Snooks and Lola Fuller on a new section of wharf built especially for the cast bronze sculpture. Mr Fuller, a grandson of Alfred Fuller, who started the family marine transport business in 1886, and his wife had been looking for a way of giving something back to the Bay of Islands community for several years. They eventually settled on a marlin statue, which they believed would enhance the wharf, be a popular subject for photos and pay homage to the Bay of Islands’ beginnings as a tourist mecca. The Bay’s first tourism boom was sparked by American writer and fisherman Zane Grey, who in 1926 described the Bay of Islands as an “Angler’s Eldorado” boasting the world’s biggest striped marlins. 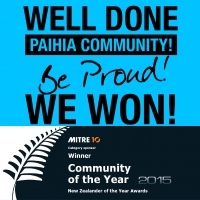 The couple met community trust Focus Paihia in 2015 to discuss the project; a survey followed to ensure it had the town’s support. The Fullers were keen for the statue to be as life-like as possible but that proved more complicated than they anticipated. They enlisted the help of daughter Sam Fuller and her husband Pieter Hobson, who decided the best way to get the proportions right was to arrange a 3D scan of a mounted striped marlin on display at the Bay of Islands Swordfish Club across the road from Paihia Wharf. They eventually found a company, Axia Design in Napier, which was intrigued by the project and the technical challenged it posed. Once the marlin had been scanned the digital model was manipulated to give the fish a jumping posture and a full-size model was made in tooling board using a computer-controlled cutter. The model was used to make a mould and the statue was cast in sections from molten bronze. Finally the pieces were welded together and a patina applied to give the bronze its final colour, including the marlin’s stripes. Saturday’s unveiling was attended by three generations of the Fuller family and more than 100 members of the Bay of Islands community. Speeches were made by Mr Fuller, his granddaughters, Deputy Mayor Tania McInnes, and Grant Harnish of Focus Paihia, which built the new section of wharf. Refreshments afterwards at the Swordfish Club included – what else – smoked marlin. A plaque on the statue’s base records the Fuller family history in the Bay starting with Alfred Fuller’s coal deliveries to the islands in 1886. Later the business expanded into mail deliveries, the famous Cream Trip and a Paihia-Russell car ferry. The family sold up in 1967; today Fullers GreatSights Bay of Islands is owned by the InterCity Group.